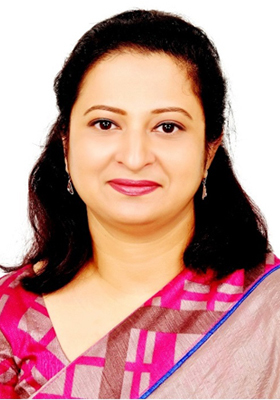 Dr. Lafifa Jamal is the Chairperson of the Department of Robotics and Mechatronics Engineering, University of Dhaka. Previously, she was the faculty member of the Department of Computer Science and Engineering, University of Dhaka. At present, she is serving as the Treasurer of Bangladesh Computer Society and Vice President of Bangladesh Open Source Network. Dr. Jamal is a Senior Member of IEEE. She is also a member of International Robot Olympiad Committee. Currently, she is the Membership Development Coordinator of IEEE RAS Bangladesh Chapter, Advisor of IEEE RAS University of Dhaka Student Branch Chapter and Moderator of Dhaka University Science Society. She was the Advisor of IEEE University of Dhaka Women in Engineering Student Branch Affinity Group in 2016 and 2017. She has been elected to the Senate of Dhaka University and has also been an elected member of the Dhaka University Teachers Association (DUTA). Actively involved with research, Dr. Jamal attended various seminars, conferences and workshops internationally. She delivered invited talks in South Korea, USA and other countries. She has more than forty International Publications. Department of Robotics and Mechatronics Engineering, University of Dhaka, Dhaka- 1000, Bangladesh.